We at E.A.T. 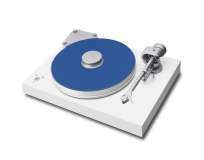 have identified a segment of the hi-fi market where those who would like to purchase turntables with greater performance and sophistication than that which is available in the budget sector, but with a price point below the widely-acclaimed C-Sharp – our most successful turntable to date. And it is the technology of C-Sharp that enabled us to develop the C-Major.